Bruno Abbate's Primatist is a company that made itself conspicuous for its capability to portray the new requirements of a very particular market such as the European one. Its boats have been for years the essence of building excellence. Harmonious lines, sparkling performance and high quality manufacture cannot be improvised. Primatist never separated from a handcraft tradition that is bordering art: each and every boat is entirely hand-laid, hulls and decks are made out of a balsa sandwich that optimally strengthens and insulates; structural strengthening are always over-engineered. The new Primatist G48 is no exception: it has a single angle, deep V shaped with an angle of 21° hull and three longitudinal strakes running from bow to stern, that provide hydrodynamic lift. Upon boarding one gets immediately a very pleasant sensation of boundless space. There is a remarkably uncluttered amount of room in the cockpit, which includes a spacious sundeck, comfortable settee and a table to eat in the open. The helmsman position has a well-distributed and versatile instrument panel with every control easily accessible and a vertical wheel which can be easily steered both standing up and sitting down. The views easily spans the whole horizon. The wrap around tinted windshield, entirely shelters everybody in the cockpit, even at the furthest aft. Interiors follow a classical and very functional design. 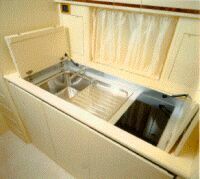 To starboard of the companionway lies the galley with a well-distributed cooking area: it includes double burners sink, fridge and lockers. To port, the dining area includes a "U"-shaped settee and a rectangular table which, if conveniently lowered, instantly converts into a spare double-bed. The two heads, the owner's and the guests', incorporate a wc, shower, basin, a small locker and teak grating. Going forward there is the owner's cabin. One can partially stand full height around the double bunk, and that makes it easier to tidy up the cabin. A hanging locker for clothes, shelves, lockers, a head-board mirror and dimming lights make up this section of the boat's accommodation. Amidships, to port, there is the guest cabin with two single bunks and an additional upper bunk. There are two electrical systems: 220V A.C. and 12-24 D.C. Everything is commanded by a control panel protected by circuit breakers. Primatist G48 is really an exciting hull. It reaches planing speed in a matter of a few seconds, with no need to work on the trim, and it easily reaches its maximum speed at 45 knots. At 2100 rpm the two MTU turbo diesel engines, 767 HP each , allow for a economic cruising speed of 37 knots: this fact alone says quite a lot of this hull's capabilities. Wave riding is soft, the wake is straight and clean. Directional stability is excellent, steering is precise and light. Turning radius, which is not much influenced by the individual settings of the engines, is perhaps a bit too wide. But it is not a major limitation on a 14.500 kg. boat, even the more so as control on minor course deviations is good. Manoeuvring from standstill and in reverse is very prompt. With Primatist G48, Bruno Abbate does not break his celebrated efficiency and presents a boat that marks the beginning of a new season which bodes well for the Como-based boat-builder. Total weight with gear box: 1.400 kg. Fuel tank capacity: 2.000 lt.
Price: with standard specification and two 435 HP TD Caterpillar engines: L. 615.000.000 plus VAT; with two 600 HP TD Caterpillar engines: L.695.000.000 plus VAT. Note: To obtain the range of the boat, the fuel tank capacity (2000 liters) must be divided by liters/miles consumption. Fuel consumption is indicated in the graph at the base of the consumption curves and the rated power as shown by the builder's specifications, but real consumption at the sea varies due to the conditions of operation of the vessel and the characteristics of the propellers installed. Construction: Fiberglas reinforced with a balsa sandwich; with kelson, stringers and ribs in spruce resined to the hull. Deck: Fiberglas reinforced with a balsa sandwich connected to the hull with stainless steel 5 mm. rivets; deck hardware: stainless steel. Foredeck: wide sundeck with cushions; steel lifeline protecting the entire deck, electrical anchor windlass, anchor with chain, two cleats, anchor well, double hatch leading to the owner's cabin and the dining area. Steering position: aeronautical layout. To port: a pilot and co-pilot's padded settee , complete instrumentation; ergonomic, three spoke, white leather covered steering wheel; to starboard: the navigator's position, tinted wrap-around windshield. 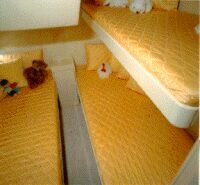 Layout and specifications: owner's cabin with double bunk, drawers, lockers, hanging locker, mirrors and forehatch; ensuite owner's heads, and includes: basin, shower, locker, teak grating and wc; guest cabin, aft of amidships, to port, with two single bunks and an additional upper bunk, locking and hanging locker; guest heads ensuite with basin, shower and wc; dining area with convertible "U"-shaped settee and a rectangular dining table which can be adjusted in height; to starbord there is a furniture with sliding fittings; galley: double-burner cooker, sink, fridge and various lockers. Optional equipment: safety provisions for off-shore navigation: L. 10.700.000; chart-plotting GPS: L. 9.500.000, multi-function GPS: L. 7.700.000, antifouling: L. 2.700.000, cradle: L. 4.800.000, VHF: L. 2.800.000, boat cover: L. 4.000.000, hydraulically operated hatches: L. 9.400.000, roll bar: L. 7.400.000, cockpit fridge: L. 3.500.000, hot-water system: L. 4.000.000, electric generator: L. 15.500.000, air conditioning: L.12.600.000, hydraulic gangway: L. 24.200.000, tender: L. 4.800.000, tender equipped with a 3 HP outboard engine: L. 6.500.000, autopilot: L.10.000.000, radar: L. 16.400.000, custom hull colour: L. 9.500.000, RINA certification: L. 1.700.000, registering fees: L.4.000.000. Maximum speed: 45 knots at 2.400 rpm. Sea quality: excellent, the boat was very stable, navigating safely and powerfully, especially considering its high performance; planing is reached quickly and easily, wave impact is soft and does not result in trim change; during turns there is no vibration on the rudder blade. Docking manoeuvrability: good, due to the twin engines, even in crowded harbours where little space is available. Deck: modern design, rational space organisation, functional, protected and uncluttered. It is very comfortable thanks to very well studied details. The cockpit is very wide and is sized to accommodate 12 people without being overcrowded. 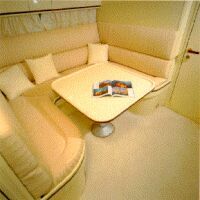 Guests can make themselves comfortable on a "U" shaped settee and very cozy aft sundeck. Bulwarks are safe and secure even when the sea is rough. Steering position and comfort: excellent. It gives the pilot the pleasure and emotions of steering an off-shore racer-like cruising boat; the seat, wheel, instruments and throttles layout is very well conceived. Accessibility of the engine compartment: good. Electrical equipment panel: conveniently located, with easy access to the rear of the panel. Excellent equipment. 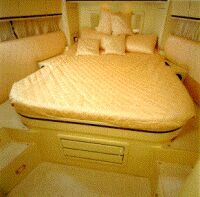 guest cabin with three bunks: too many for such a refined boat.